Hello readers, It is no secret that I am a huge fan of many of the products coming out of Forgeworld – from the super detailed models full of character to the very useful Imperial Armour Masterclass Vol. 1 (Really looking forward to a Vol. 2). Even the award that gets place of pride in my display cabinets amongst all my demons and other awards is the Forgeworld Best Of Show plaque that I won this year.That being said, today represents a very exciting opportunity for me as I have recently been given the privilege of trying out some new products that have just been introduced to the hobby market by Forgeworld – their own set of weathering powders.Anyone who has followed my website over the past few years knows that weathering powders have often held a place in my work – whether for golden demons or for my armies. 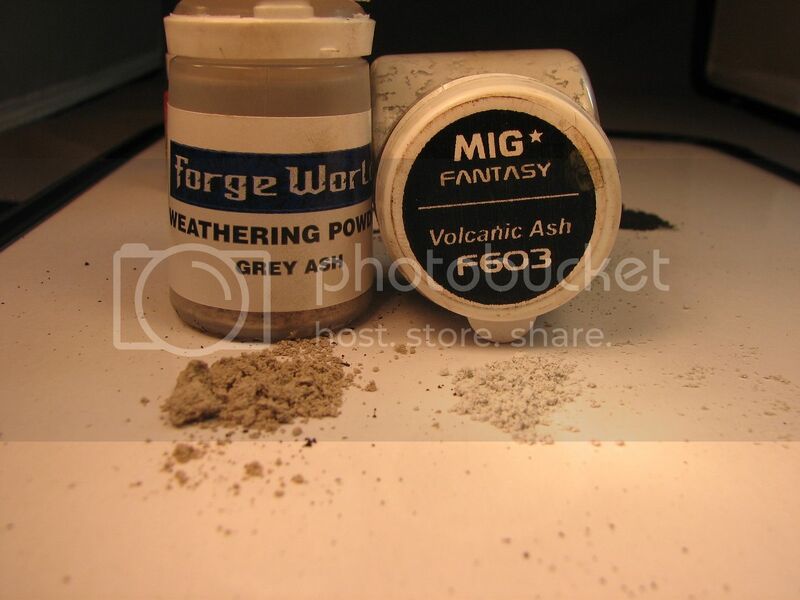 In the last couple years I have reviewed pigments from Doc O’Briens, Stardust and more recently Mig Productions so it really interests me to see what Forgeworld will be bringing to the table in comparison. I am very pleased that Forgeworld let me get my hands on a set so as to see what I think and how they work for me. I will be comparing them here to other pigments I own and returning to discuss the use of them as an ongoing review process throughout this year as I make use of them in several of my projects. When I unboxed these I was surprised by the utilitarian packaging and overall look of the product - very unlike the flashy presentation of say the MIG powders. That being said I LOVE the bottles they have chosen to hold the powders because I know that they will be secure. They have used the same style pots as the original GW paints. I have about a dozen jars of these paints which seal so well that 20+ YEARS later my paint is still fresh! I do, however, appreciate that FW is conscious that flashier packaging probably isn’t really that necessary in that most of their product is being sold direct from them (as opposed to competing for attention/rack space in hobby stores) and that in this case they really seem to be passing much of the savings on to the consumer! YEP!!!! These puppies come in at just over $4.00 Canadian individually and just under $24.oo Canadian for the whole set! That makes them a little over half the cost of many other comparable products!!!!! I for one am happy for the added value. Opening the jars I find that these pigments are of a nice even consistency. 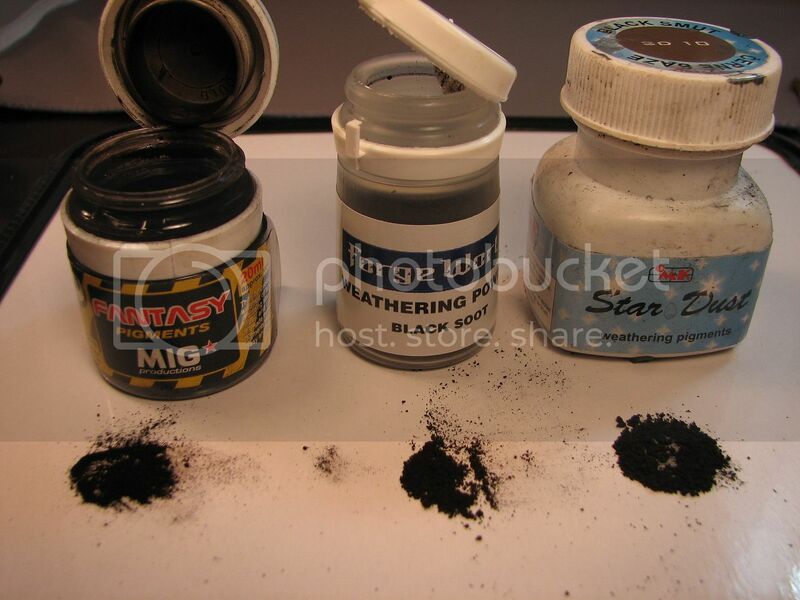 They do not appear to be quite as finely ground as the Mig fantasy pigments and actually look really similar in this respect to the Stardust pigments. The colour saturation is very good - much better than the Doc O’Brien’s and with a much warmer tone than either the Stardust or the Mig. (Especially clear in the shot of the grey powders !) 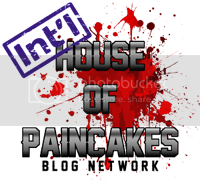 This is something I am VERY pleased about as these will give me a great deal more options for colouration and really means that the Forgeworld Pigments do indeed represent something a little different than their competition. I am particularly pleased that these will also fill in some very noticeable gaps in mid tone colour ranges without the need to do additional mixtures of pigment. These look like they ought to be a great! Aside from the warm tones I am also genuinely pleased with the selection of colours – again a very utilitarian approach. I can immediately relate to all of these colours in terms of their usefulness, application and possibilities for mixing. I think that for anyone who is making their first foray into powders that the colours here will be very approachable, make good sense and provide even more good value for the investment. 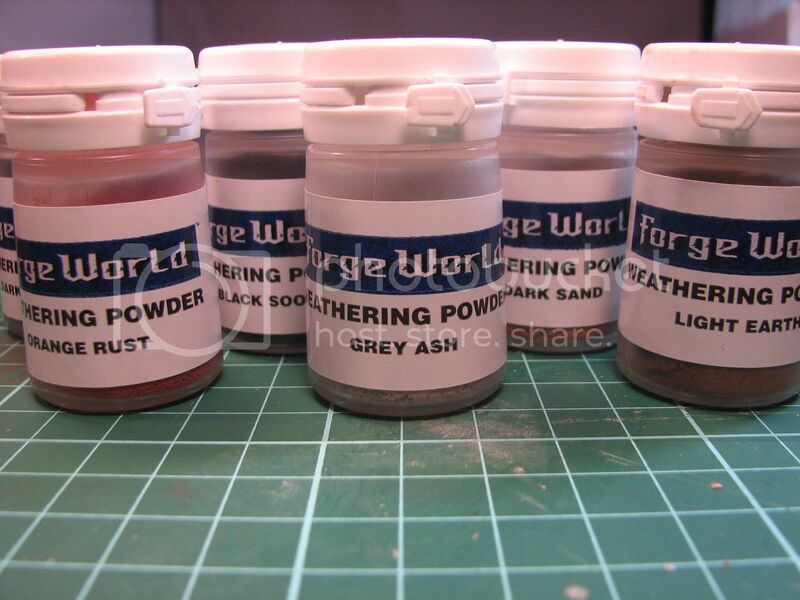 I have a few close friends who have been discussing taking the leap into weathering and pigments and I have honestly already told them to put in their orders for these Forgeworld products. 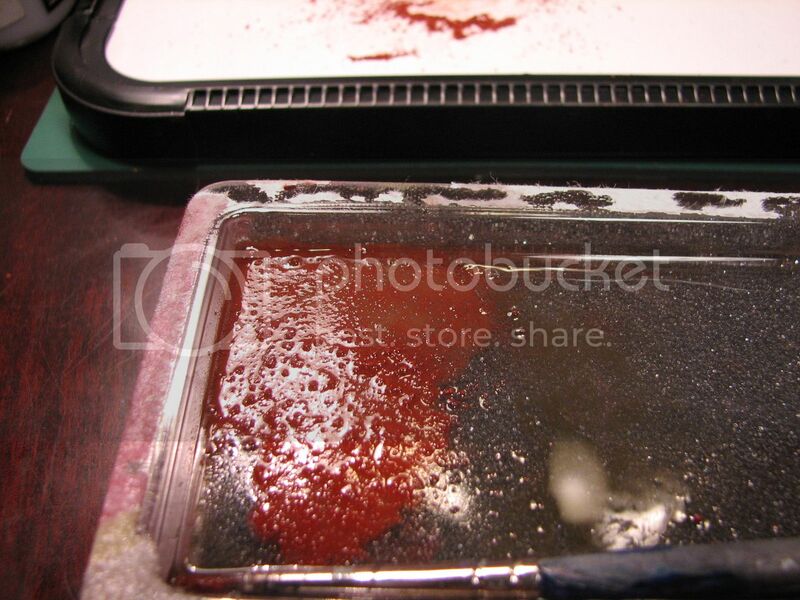 I think that of this entire review, this should clearly illustrate how pleased I really am with these pigments. Overall my first impression of these is excellent - the texture and consistency looks good, I believe the warm tones are going to prove valuable and useful and the range of colours is really well suited for beginner and pro alike. So lets give them a try! 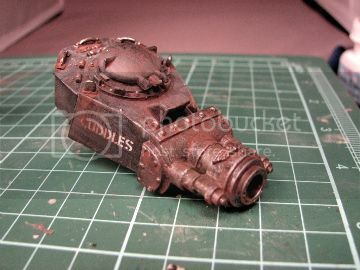 <!--[if !vml]--><!--[endif]-->What I have here is a turret from my apocalypse tank company. I recently swapped demolisher cannons with a buddy who needed the smaller stubby one to match his army. As such the barrel on this looks far too shiny for my weather-beaten tank. 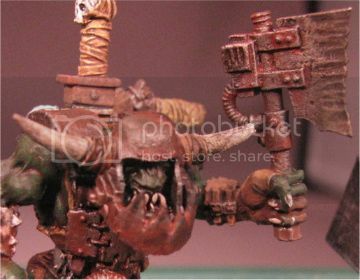 I have also grabbed an old Ork Nob painted by a friend so that I could show a couple other applications as well. 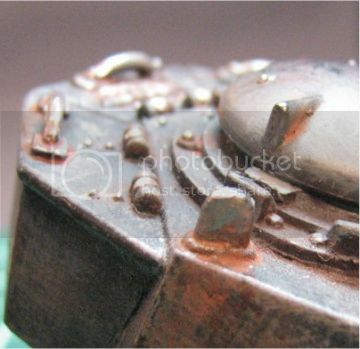 The turret was really quite straight forward – I took the rust colour (which you can see in the above picture is a much stronger orange than either the Mig or Stardust comparable tones that were in my collection) and mixed it with some thinner. The powder dissolved nicely and behaved consistently and as expected when I used it. Once dry I was really quite pleased with the look – the pigment dries to a realistic fresh oxidized colour and finish. 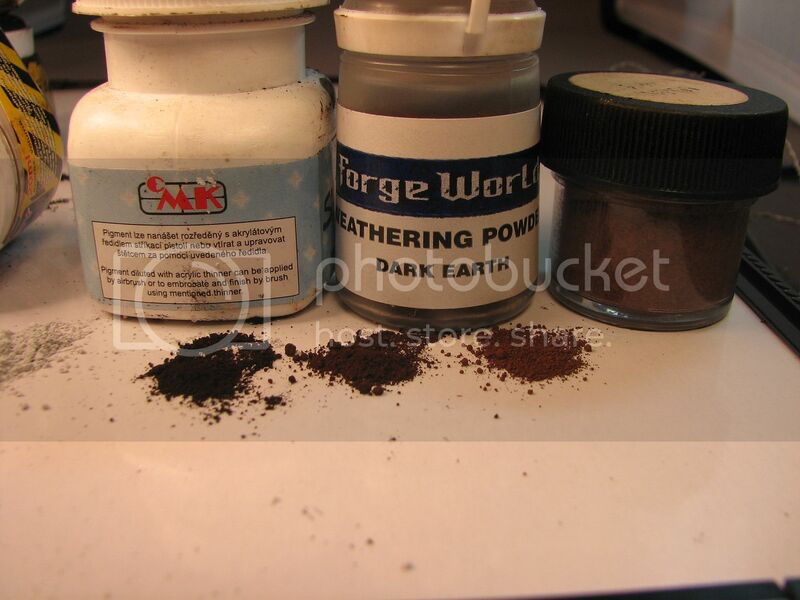 It made doing basic rust really easy and with the addition of some black or dark earth I am quite confident that darker or more multi hued rusting would be easily achievable. Afterwards I went back with a clean brush, some fresh thinner and a soft cloth and edited my work a bit – worked fine – no unexpected hiccups. The Ork gave me a chance to try a couple things – a horde army like this is often very demanding of the painter who wants to make their models look cool and stand out from the crowd. With this in mind I tried a couple of quick techniques to add some life to the model without eating too deeply into precious hobby time. So the techniques I used here are ones that can be done quickly across entire squads/armies to either finish them off or to refresh and old force! 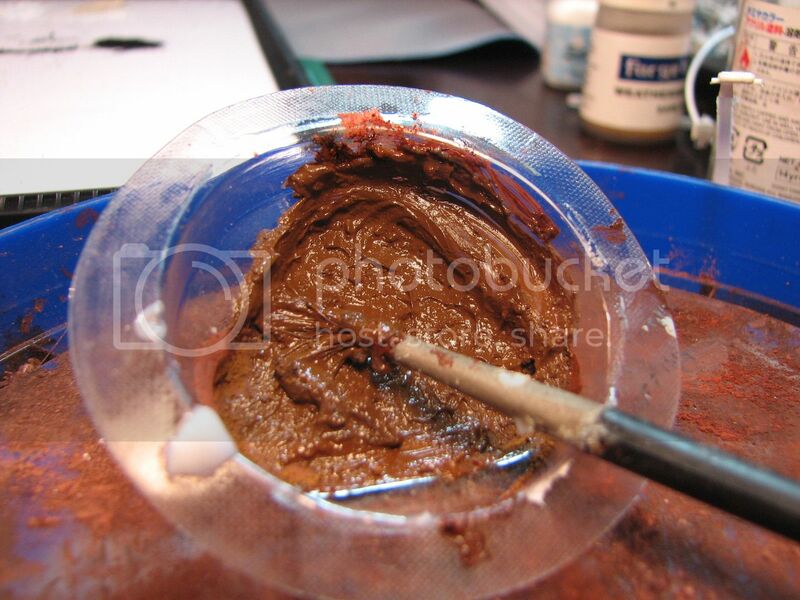 First I mixed the pigments with some acrylic resin to make a nice thick paste. 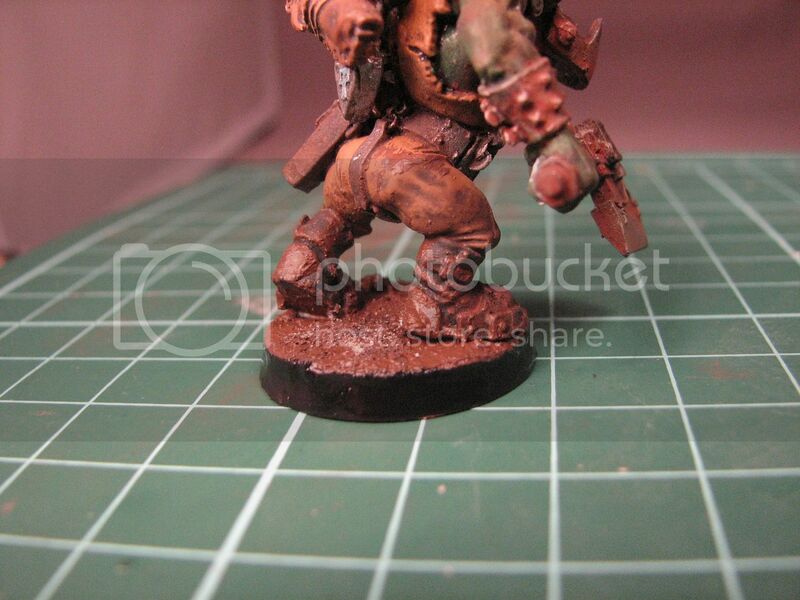 I then took the paste and applied it to the base of the model, the boots, some small spatters on the pants and onto some of the lower parts of the armour and equipment. Even when this dries it gives the impression of being a bit wet (due to a glossy component in the resin) and gives the look of fresh churned mud. 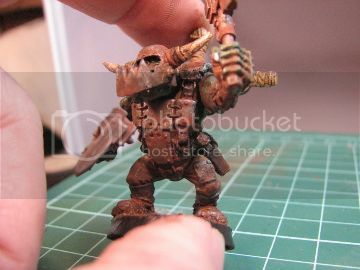 I then took a wash made of orange rust and dark earth and applied it liberally to the metal parts using just my finger to wipe it back if I felt I went overboard and also making sure to go back around all rivets and bolt heads with a little extra. A second thin wash with some Black soot was added on a few of the flatter surfaces this helped to flood away or mix slightly just a touch of the orange – giving the whole thing a very realistic worn metallic finish with a negligible amount of effort. 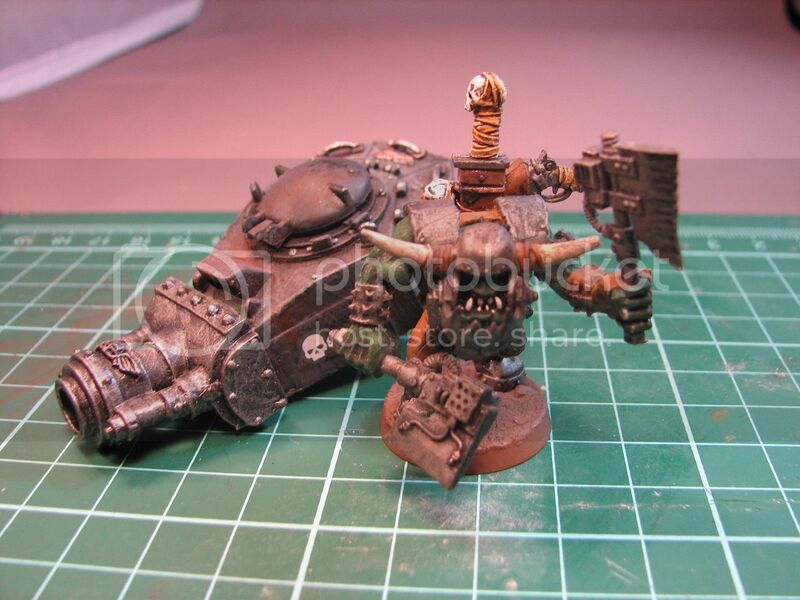 With a little clean up and touch up this Ork (and likely his many brethren) will be table worthy again in no time! 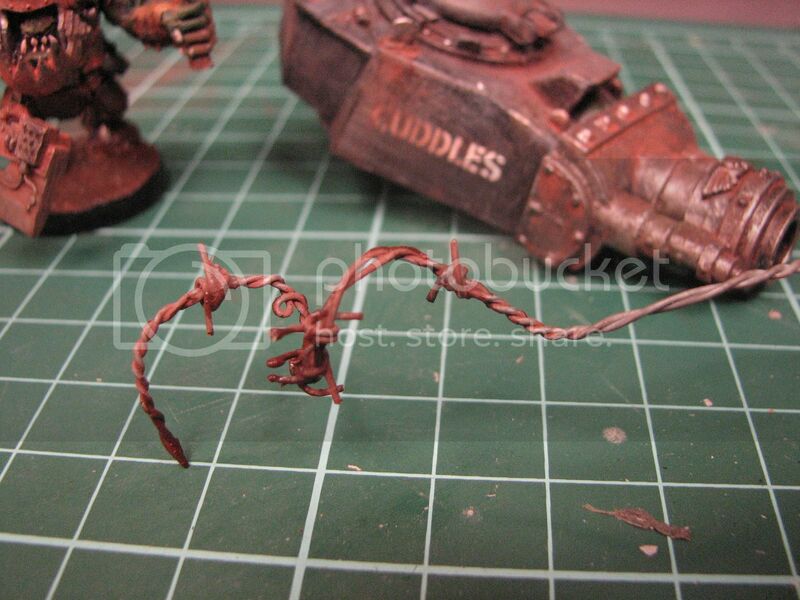 I also took the same mixes and applied it to some hastily made barbed wire – I think this demonstrates a bit of how easy this will apply to all the scenery makers out there as well. 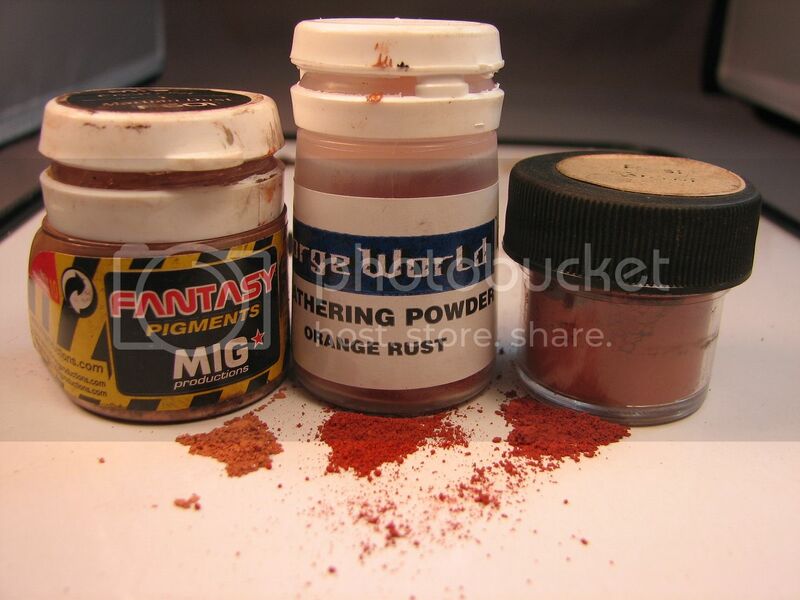 Preliminary Verdict Have Forgeworld reinvented the wheel with these new pigments? No. What they have done is created a product that represents great value for money, has a solid range of very pleasing and useful tones and which performs comparably to its peers. They further backed this release with a growing series of books (rumours of Masterclass vol.2 have already started to make their rounds on the net) that do a great job of illustrating uses and applications of weathering pigments. What Forgeworld has done is to make great moves to make these techniques, products and applications more accessible to hobbyists worldwide. Well Done Forgeworld.